Looks like he has his mother's eyes. 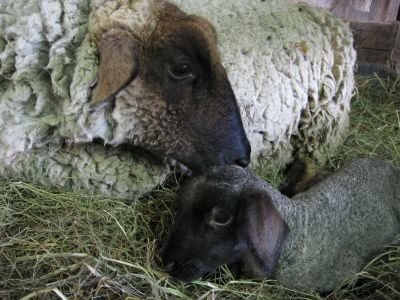 Lamb Report: This handsome guy, who is just 3 hours old in this photo, was born this morning to Amy (who was named after my pal Amy). And yes, his arrival necessitated yet another early check-out at The Bonding Suite Inn--much to Silly Wendy's dismay (she actually turned her back to the open gate and refused to come out--click here for a bonus baby photo). Six lambs in five days. Now this is how it should be. Still several more to go (these girls are so big they don't waddle--they swagger), but at this rate we'll be done in no time. Current lamb count: 15. Mini Milestone: I just realized that the 300th Daily Farm Photo came and went without my knowing it. The time sure flies by (too bad it wasn't the butterfly.) Click here to see the 100th Daily Farm Photo. So do you have any favorites? What a great picture ... so adorable! yup, he's adorable. no question about that. so, the current count is 15 -- what's the ratio of girls to boys? how many momma's are in waiting for their babies? i still need to show off Martin and Amy. two baby show goats that my neighbor has -- his daughter adopted them -- one is an orphan and the other is from triplets. very sweet spoilt babies. Ohhh! I don't think I ever visit your blog without getting teary-eyed at the sweet pictures. Talk about melting your heart! Aw, I miss the when we use to have sheep. Now all we have is 250 head of cows, and 5 broodmares. We are over halfway done with the calving, 180 calves on the ground. So you post a picture as cute as this, and then ask if we have any favorites?? ALL OF THEM!! Aside from the animal pics (even the chickenz), which are in their own cute category, I love the heart rocks, and your seasonal before/after pics. You're all set for Easter with all these babies... You can dress them as bunnies and take them around-- I guess lambs work well too! I just had to click on the bonus lamb picture. What a way to start my day off with an ahhhhhh. Can you start me off every day that way?? Shearing update: No shearing as scheduled this past Sat. The skies opened up and dumped a wicked amount of rain. Sheep were pinned up but shearer didn't come because of the rain. We are rescheduled for the 22nd. I almost can't sleep because I am so excited!!!!! Awww... so cute. I have farm envy now. And happy 300th post! My all-time fave photos are still the swing ones and the reflection ones for sure. Happy 300th post--I promise not to stay away this long again!